The scorching Kenyan sun has set. Mosquitoes have descended, buzzing about our ears, landing on tiny patches of skin where the repellant missed. There was hardly any breeze, turning the seven-by-five-foot cabin into a stuffy sauna. I rubbed more Deet into the areas where the mozzies bit, making my skin burn under the heat and humidity of the savannah air. I drained the remaining contents of the mineral water bottle, deformed by the heat. The lukewarm liquid tasted of chlorine and did nothing to quench my thirst. We have been on the train since 10:00 PM, and what seemed like a fun adventure in the beginning turned into a nightmarish journey nineteen hours on what was supposed to be a twelve-hour trip from Nairobi to Mombasa. I looked out the window, hoping to see the famous red elephants of Tsavo. Zebras and baboons were aplenty, but I wanted to see the elephants. The reason we decided to hop on the Lunatic Express in the first place. We later learned that the construction of the Standard Gauge Railway chased most of the wildlife away—the price you pay for so-called “development.” I gazed at the gnarled roots of withered shrubs and desiccated riverbeds. January in Safari Country is merciless–dry, hot, unforgiving. As the century-old train snaked its way through the national park, I glimpsed at vultures and Maribou storks swopping overhead. At least, like the mosquitoes, they will feast on something tonight. As the train screeched to a temporary halt to let a cargo train pass, children came out of nowhere, their scrawny arms outstretched, hustling for an apple, a half-eaten loaf of bread, some pieces of candy, and if they’re lucky an unopened bottle of water from tourists onboard. Some of them will have food on the dinner table tonight; others will sleep hungry again. The train whistled to announce its arrival in Mombasa, the final note hung in the air, moaning, as if to warn me it’s not going to be an easy year. The following days, we embarked on a road trip in Uganda with my travel-blogging-idols-turned-friends, Ron of Flip’nTravels and Gay of Pinay Travel Junkie, with Shervin and Luna in tow. And despite having had to deal with corrupt immigration officers at the Kenya-Uganda border and shady traffic police on our way to Murchison Falls, to John and I, drunk with the excitement of starting a new life together, the journey was seamless. In Juba, night came too soon and lasted for days. Sounds of gunfire and mortars dropped from helicopter gunships echoed through the air, drowning the familiar hum of generators and haunting screams of wounded soldiers and civilians mourning the passing of loved ones. What was supposed to be a celebration of independence of the fledging South Sudan turned into a bloody battle between political and ethnic rivals in the capital. Locked-down for days, we rationed food and water and fuel, our hopes for survival hinged on the opening of the airport. When ceasefire was called, we hurtled along the road to our freedom with alarming speed, leaving behind women and children, desperately clutching what was left of their former lives, their gaze empty, their faces gaunt, crumpled with a look of complete hopelessness, wrenching my heart. The airport was bustling with humanitarian workers, oil field contractors, diplomats. The entire world has turned its back on South Sudan. After three weeks of debriefs, psychosocial sessions, and a trip to the coast in Kenya, I was back in Juba. But things would never be the same again. I was told I might have PTSD (post-traumatic stress disorder). Waking up to the smell of freshly baked croissants and filling my lungs with the cool crisp autumn air seemed surreal. Here, in this world, survival means catching the metro and reaching one’s destination on time. It means remembering how to say “I want more cheese in my sandwich please” in perfect French. It is taking the correct bus back to the hotel. Here, the only reminder of one’s mortality is a leaflet of instructions on what to do in case of a terror attack and a list of crowded places to avoid. Here, during hours of solitary walking in the cobble-stoned streets of Vieux Lyon, in a country suspended in a “state of emergency,” I found some semblance of peace. The weather forecast for El Nido was grim: rain showers and thunderstorms loomed. Yet, in between bouts of depression and last-minute arrangements with suppliers came moments of excitement. 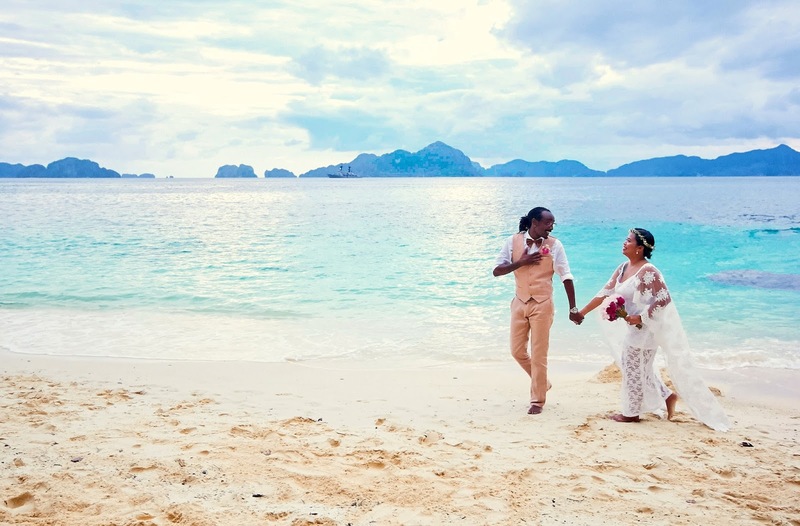 Getting married to the love of my life, in one of the best islands in the world, with only the closest family and friends bearing witness to the union of souls and culture, brought about a sense of fulfilment and contentment. Finally, I was home. I gaze at the vast stretch of powdery white sand in Kenya’s south coast—occasionally punctuated by the Maasai clad in red blankets,selling beaded wares to sunburnt tourists—submerged in deep thought. A family of camels decorated with plastic flowers and Chinese-made Persian rugs ferry screaming children and laughing mothers from one end of the beach to a cove nearby. Once in a while, a jetski slices through the calm waters of the Indian Ocean, while a hydroplane hovers above. Beyond the horizon lies a different world, a world of fears and worries materializing, of hopes and dreams coming true. It has been a tough year. It was a test of sorts. A test of faith, of friendships, of loyalty, of perseverance, of love. It took me to distant places I never knew existed. This blog post is an entry to the PTB Blog Carnival for January 2017 hosted by Pinoy Adventurista.